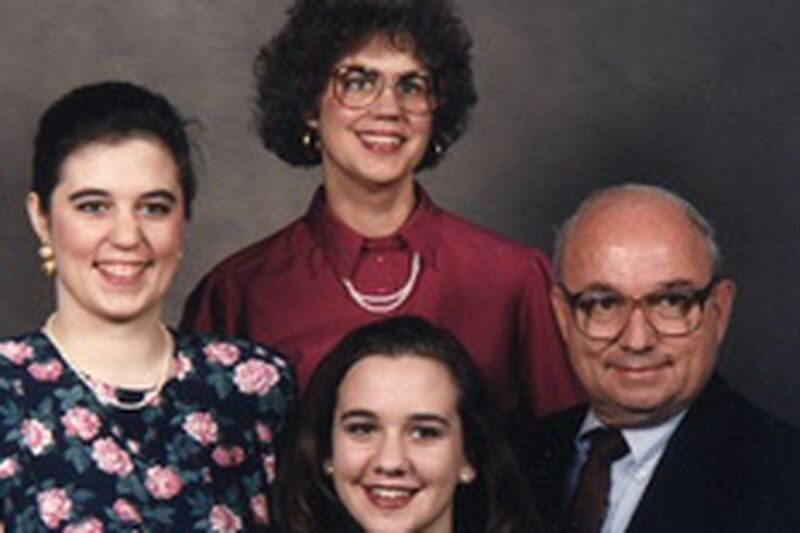 The Bechtel family: Until daughter Carrah was 19, Bob Bechtel had told only his wife, Bev, about his terrible secret. At Swarthmore College on Jan. 11, 1955, Bob Bechtel shot and killed a fellow student, Francis Holmes Strozier. One bullet, from a .22-caliber rifle, in the head. Five years later, Bechtel was at Susquehanna University, pursuing a degree in psychology. Fifty years later, in 2005, filmmaker Macky Alston trained a camera on Bechtel, now a professor of environmental psychology at the University of Arizona. His daughters Carrah Bechtel and Amanda Willis were there. So was Bev Bechtel, his wife. The Killer Within, the documentary showing tomorrow and Sunday at the Philadelphia Film Festival, is about the night that Bechtel, a proctor in Swarthmore's Wharton Hall dorm, a kid who had grown up taunted and bullied, finally had had enough. He had driven home to Pottstown, eaten a slice of his mother's coconut cake, taken his gun, and returned to campus. He was going to exact vengeance on students he said had hazed and degraded him. But after shooting Strozier and firing a few rounds in the hall, Bechtel put the gun down. "A lot of people have this idea that I must have been angry or enraged or something," said Bechtel, 74, reached at his home in Tucson on Tuesday. "Actually, I was just pretty scared, and as soon as I shot . . . I had this feeling of a hand over my heart, and I just gave up on the whole thing right then. "As far as I was concerned, I would just go to the police, turn myself in and go right to the chair, get it over with." Found not guilty by reason of insanity, the 22-year-old Bechtel was sent to Farview State Hospital, in Waymart, Wayne County. One factor that swayed the judge: a letter from Strozier's mother, expressing sympathy and forgiveness. Another: In 1950, the teenage Bechtel, at his mother's request, had been briefly hospitalized for psychotic episodes. Four years and eight months after the sentencing, Bechtel was released. He went to Susquehanna and then to the University of Kansas, where he earned a doctorate and began his teaching career. Until his daughter Carrah turned 19, the only person in his life who knew of the murder was Bev, his wife. Then he decided to tell his daughters, his friends, his colleagues at the University of Arizona, and his students. Alston's film is about Bechtel's revelation, and its aftershocks. It is a story about forgiveness and guilt and, by extension, about Columbine, Nickel Mines, and other school massacres that have left their bloody mark on the nation. It is about a life lived. And a life not lived. "If you're for the death penalty and say you believe in God, what do you do with the good that can come from a life?" said documentarian Alston, who met Carrah Bechtel when both were students at Union Theological Seminary in New York. Carrah had approached Alston with the idea for a film. "When I think of all the people who are locked away and weigh the good that they can do against the bad that they have done, I'm left with this trouble in my heart," Alston said during an interview last fall at the Toronto International Film Festival. For Carrah Bechtel, 32, the discovery that her father was a murderer opened a floodgate. "I actually couldn't comprehend what he was telling me, and still can't - that he is that person," said the self-described writer/actor/baker/songwriter, who lives with her older half sister, Amanda, in Kansas City. It made her realize that she might not be here at all if her father had been sentenced to death, or to a long term behind bars. "Every day, I question my existence," she said, also in Toronto. "There are people in the asylum that let my father go, the mother that forgave my father - people who didn't know it at the time, but [they] created life. Desmond Tutu has a book: No Future Without Forgiveness. And forgiveness creates future. . . . That's my perspective." While making The Killer Within, Alston discovered that Bechtel's victim's brother, John Strozier, lived just a few hours from Bechtel in Arizona. When the news came out about Bechtel's past, Strozier read it in his local paper. The headline implied that Francis Holmes Strozier had been among the group of students Bechtel suspected of vicious pranks. "I wrote a letter to John Strozier," said Bechtel, who acknowledges that he didn't know whether his victim had been involved. "The headline said I killed 'my tormentor,' and that really upset him because it made it look like Strozier was a mean person, and I had never said anything like that. . . . So I wrote to John Strozier, and I said I'm really sorry about this, and I'm also terribly sorry about what I did, and so on, but I never heard anything. "And that's perfectly his right - I can understand he doesn't want to have anything to do with me." Bechtel speaks of the events at Swarthmore with matter-of-factness. In the film, he is seen with his family retracing steps at Swarthmore and Farview, not a hint of emotion on his face, nor in his voice. His daughters say he is and has always been reserved. Bechtel recognizes the perception that he is cold. "But this was 50 years ago," he said, "and I'd been through this so many times. . . . And I don't necessarily show emotions anyway. "You also have to remember - and I think this is mentioned in the film - that people used to get me to cry for their amusement. That's one thing I learned to resist - the idea of crying." Though he agreed to participate in the film at the behest of his daughter, Carrah, Bechtel is not particularly happy with the way The Killer Within turned out. "Who wants to be known because they killed somebody?" he asked. He also believes that the documentary underplays what he sees as the root of his actions. In his view, he suffered from post-traumatic stress disorder. Since he was 4, Bechtel said, he had been the target of bullying and taunting, continuing through Swarthmore. "Children are traumatized by bullying, and I was traumatized many times," said Bechtel, who successfully lobbied the Arizona legislature to pass a bill protecting students from bullying. "And it's not the bullying at Swarthmore that really caused it; it's that whole history of bullying that I brought to Swarthmore, and that's what triggered it off." In a prepared statement, Swarthmore officials term The Killer Within "compelling but potentially misleading." The school, which launched an investigation into the shooting in 1955, takes issue with Bechtel's claims of rampant harassment. "Out of respect for the Strozier family and our alumni from the time, and for the sake of accuracy, the Swarthmore administration objects to Robert Bechtel's misleading portrayal of the events of 1955. . . . Prof. Bechtel appears to attribute the shooting solely or primarily to 'bullying' perpetrated by his fellow students. Holmes Strozier was a completely innocent victim, and no one can watch the film without being moved by the nobility and generosity of his family." Amanda Willis, Bev Bechtel's daughter from a prior marriage, said her stepfather's actions forever haunt her. "It's something that I'll never understand about an insane mind," she said. "That the insane mind doesn't know it's insane. And my father says that very clearly: There was just no question. You take a gun and you shoot people. "It was not an odd moment to him, and that's when you know you're pretty far gone."